Murphy has proven there's an appetite for the musical format on television, as long as it's (in alphabetical order) AutoTuned, big, bold, brassy, and candy-colorful. 1040 min. FOX. Directors: Ryan Murphy, Joss Whedon. Cast: Lea Michele, Jane Lynch, Dianna Agron, Jayma Mays, Stephen Tobolowsky, Idina Menzel, Kristin Chenoweth. Variety shows may be dead. And MTV may no longer be in the business of "music television." But people still love a little song and dance. The weekly television musical has failed spectacularly in the past, with ABC's ambitious (and too-much-maligned) Cop Rock producing original material, and CBS' Viva Laughlin going the "jukebox musical" route. But Fox, emboldened by American Idol, rolled the dice with Glee, a weekly hour of musical comedy created by Ryan Murphy (Nip/Tuck), Brad Falchuk, and Ian Brennan. The gamble paid off big: Glee became an instant hit, putting a stranglehold on the zeitgeist. With the first season now hitting home video, and the show's ratings climbing to new heights, Murphy has proven there's an appetite for the musical format on television, as long as it's (in alphabetical order) AutoTuned, big, bold, brassy, and candy-colorful. Perhaps Glee succeeds where others have failed because it smartly builds into its premise an excuse for a steady flow of music. The show is set at the fictional McKinley High School in Ohio, where languishing show choir (a.k.a. "glee club") "New Directions" gets a second chance under the leadership of teacher Will Schuester (Matthew Morrison, Tony Award nominee for The Light in the Piazza). In the eyes of the school, the "gleeks" are utter losers, a motley bunch that includes self-righteous diva Rachel Berry (Lea Michele of Broadway's Spring Awakening), touchy, plus-size diva-in-training Mercedes Jones (Amber Riley), halfway out of the closet Kurt Hummel (Chris Colfer), wheelchair-bound Artie Abrams (Kevin McHale), and stuttering Tina Cohen-Chang (Jenna Ushkowitz), among others. Recognizing that the glee clubbers are easy targets for bullying and ridicule, Schuester determines to recruit "cool" kids to fill out the ranks of New Directions. He attracts football stars Finn Hudson (Cory Monteith), Noah "Puck" Puckerman (Mark Salling) and Mike Chang (Harry Shum, Jr.), as well as cheer-squad "Cheerios" Quinn Fabray (Dianna Agron), Santana Lopez (Naya Rivera) and Brittany Pierce (Heather Morris). The pilot plays out not like a cross of High School Musical with Election, with Rachel the high-strung, insanely driven Reese Witherspoon character; Finn the dimwitted and malleable Chris Klein character, and Schuester the good-intentioned but fumbling Matthew Broderick character. But the eleventh-hour promotion of The 40-Year-Old Virgin's Jane Lynch to series regular—as Cheerios coach Sue Sylvester—helped to shape a distinct identity for the series: as "Shue"'s nemesis, Sue heightens every situation by injecting her special brand of trouble, always accompanied by outrageous, offensive verbal poison ("I empower my Cheerios to be champions. Do they go to college? I don't know. I don't care. Should they learn Spanish? Sure, if they wanna become dishwashers and gardeners"). Some of the funniest scenes involve principal Figgins (Iqbal Theba) refereeing between Schuester and Sylvester. The first season also plays out a demented love quadrangle between Schuester, his scheming wife Terri (Jessalyn Gilsig of Boston Public), the school's OCD guidance counselor Emma Pilsbury (Jayma Mays), and her gym-coach fiance Ken Tanaka (Patrick Gallagher). Prominent guest stars include Stephen Tobolowsky (Groundhog Day), Michael Hitchcock (A Mighty Wind), Olivia Newton-John, Josh Groban, and a host of Broadway stars: John Lloyd Young, Sarah Drew, Victor Garber and Debra Monk as Schuester's parents, Kristin Chenoweth as former glee club star April Rhodes, Idina Menzel as Vocal Adrenaline coach Shelby Corcoran, and Michele's former Spring Awakening co-star (and BFF) Jonathan Groff as Vocal Adrenaline's star soloist Jesse St. James and—in an episode helmed by guest director Joss Whedon—Neil Patrick Harris as Will's former glee-club rival Bryan Ryan. The steady stream of vivid characters, from students and faculty to the revolving door of guest stars, help to keep the show from stalling. It may not be a variety show, but there's plenty of novelty. The Whedon episode catered to cult-TV fans, but the most buzzed-about installment was certainly "The Power of Madonna," a theme episode exclusively populated with tunes from the Material Girl. Glee's music allows it to be not only a wacky high-school comedy-drama a la Boston Public (tackling the now customary issues of teen pregnancy, coming out, and the like), but also a constant hit parade. "New Directions" is always trying out new material, in the quest to beat out rival group "Vocal Adrenaline" to place at Sectionals, Regionals and eventually Nationals. Part of the show's instant success must be attributed to "New Directions"' glee-ful cover, in the Pilot, of Journey's "Don't Stop Believin'," but Season One's twenty-two episodes include over 130 songs from the worlds of pop, rock, R&B, hip-hop, and Broadway. One of the season's cleverest moments finds Schuester performing a mash-up of The Police's "Don't Stand So Close to Me" and Gary Puckett & the Union Gap's "Young Girl" in a sadly unsuccessful attempt to send Rachel a message that her crush on him is inappropriate. Kurt teaches the football team to loosen up with Beyonce's "Single Ladies (Put a Ring on It)," Mercedes wails Jazmine Sullivan's "Bust Your Windows," and Rachel belts out Rihanna's "Take a Bow," Lady Gaga's "Poker Face," "Maybe This Time" (a duet with Chenoweth) from Cabaret and "Defying Gravity" (alongside Kurt) from Wicked, among others. Renewed for a third season before the first even finished airing, Glee is a phenomenon that promises to stick around for a while. 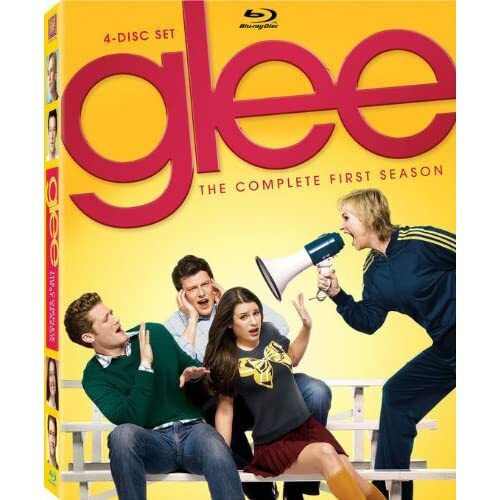 Fox delivers Glee: The Complete First Season in Blu-ray and DVD packages built to impress. On high-def Blu-ray, the twenty-two Season One episodes dazzle, with texture and detail that give the picture an impressive dimensionality. Color and black level earn high marks, and the lossless DTS-HD Master Audio 5.1 surround mixes deliver jaw-droppingly full wraparound sound in delivering the all-important musical numbers. With Amazon pricing the Blu-ray at just a few bucks more than the DVD, it's a no-brainer to invest in the four-disc hi-def set. The one glaring omission from the bonus features is a presentation of footage from the Glee live concerts, but the extras here will please fans all the same. The Blu-exclusive Behind the Pilot: A Visual Commentary with Cast and Crew (HD) puts cast and creators side-by-side with the extended director's cut of the Pilot for a rollicking video commentary. Glee Sing Along Karaoke (10:21 with "Play All" option, HD) offers karaoke versions of "Alone," "Somebody to Love," "Keep Holding On," and "Don't Stop Believin'," while Glee Music Jukebox (HD) is simply scene access to jump directly to favorite songs or enjoy them on "shuffle" play. "Staying in Step with Glee" (6:16, HD) apes the High School Musical DVDs by having choreographer Zach Woodlee and a few of the cast teach the dance accompanying the song "Rehab." "Bite Their Style: Dress Like Your Favorite Gleek" (8:52, HD) invites costume designer Lou Eyrich to explain the show's fashions. In "Unleashing the Power of Madonna" (10:36, HD), Glee's music producer Adam Anders and cast members share their feelings about "The Power of Madonna." "The Making of a Showstopper" (17:22, HD) details the adaptation, rehearsal and performance of Queen's "Bohemian Rhapsody" in season finale "Journey." "Welcome to McKinley!" (5:07, SD) finds Principal Figgins playing host in a welcome video for students. "Glee Music Video" (2:44, SD) is a promo using the song "Find Me Someone To Love." "Deconstructing Glee with Ryan Murphy" (2:49, SD) is a brief promo interview with the co-creator. "Dance Boot Camp" (3:12, SD) offers a glimpse of the actors' first dance rehearsal. Things You Don't Know About… comprises brief self-confessing bio videos by Jayma Mays (:39, SD), Cory Monteith (1:00, SD), Amber Riley (:58, SD), and Chris Colfer (:41, SD), while "Video Diaries" (17:10, SD) includes entries by Jane Lynch, Lea Michele, Matthew Morrison, Cory Monteith, Kevin McHale, Amber Riley, Chris Colfer, and Dianna Agron. "Jane Lynch A to Glee" (:52, SD) is a hilariously random extra, with Lynch reciting her line from her first school play, and in "Meet Jane Lynch" (1:03, SD), the actress submits to an all-too-brief interview about Sue Sylvester. The Glee promotional juggernaut reaches fever pitch with this home-video release; rest assured that the Blu-ray delivers the goods for hours of enjoyment. All site content © 2000-2019 Peter Canavese. Page generated at 04/25/2019 03:29:14PM.